Guru Angad Dev was born on March 31, 1504 in a village called Harike in Ferozepur district of the Punjab. His father, Bhai Pheru was a trader. His parents called him Lehna. He was married at the age of fifteen. His wife, Khivi was a native of Mattei di Sarai in Ferozepur district. His father grew weary of Harike and with his family returned to his ancestral place, Mattei di Sarai and lived there. Bhai Lehna's wife gave birth to two daughters, Amro and Anokhi, and two sons called Dasu and Datu. When Mattei di Sarai was sacked by the Mughals and Baloches, Bhai Lehna and his father moved to Khadur, now a famous town near Tarn Taran. Bhai Lehna grew very religious under the influence of his mother, Daya Kaur, and became a devotee of Durga, the goddess of Shakti. He used to organize yearly pilgrimage of devout Hindus to Jawalamukhi, a place of Durga temple in the lower Himalayas where fire issued from the mountains. He used to lead Durga dance around the fire in a harness of jingling bells. peace. After the day break he asked Jodha who had composed that stimulating hymn. 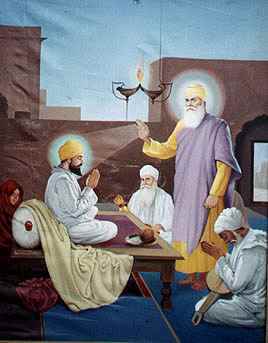 Bhai Jodha then told him all about Guru Nanak, who was living at Kartarpur at that time. The touch of divine Sabad made such an impact on Bhai Lehna's mind that he got impatient to meet the Guru. When he was on his annual pilgrimage to Jawalamukhi, he broke his journey at Kartarpur to offer his obeisance to the Guru. During his meeting, the Guru spoke to him of the True Creator, leaving such an mpression on Bhai Lehna that he threw away the jingling bells, which he was carrying with him to dance before the goddess. He had obtained such a peace of mind that he decided to discontinue his pilgrimage and abide with the Guru. On seeing his ncreasing devotion, the Guru said to him one day that he should go home and settle his affairs and on his return he would initiate him as his Sikh. Upon this Bhai Lehna returned to Khadur for some time. "Angad got the same tilak, the same umbrella over his head, and was seated on the same true throne as Guru Nanak. The seal of Guru Nanak's hand entered Guru Angad's, and proclaimed his sovereignty." 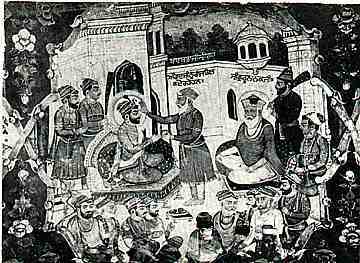 After his appointment to the Guruship, Guru Nanak directed Guru Angad to return to Khadur. Upon this Guru Angad returned to Khadur and lived there. he received, the Guru passed on to his kitchen. There were continuous preaching, singing of hymns and repetition of Name. "Where was your sword when you were facing Sher Shah? Now when you have come amongst the priests, instead of saluting them respectfully, you want to draw your sword on them. In a cowardly manner you fled from the battle ground, now posing as a hero you wish to attack the priests engaged in their devotion." country, and when thou returnest thou shalt recover thy kingdom." Humayun went back to his country and having obtained a reinforcement of cavalry from the king of Persia, he returned to India. After fighting a pitched battle he recovered his empire and captured Delhi.